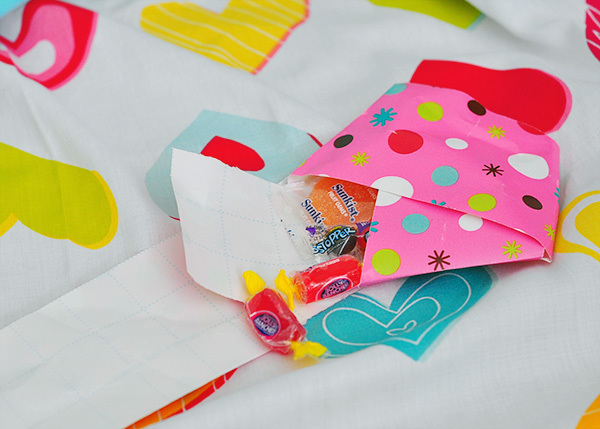 Here is a twist on the origami stars, fill them with candy or small toys for party favors. 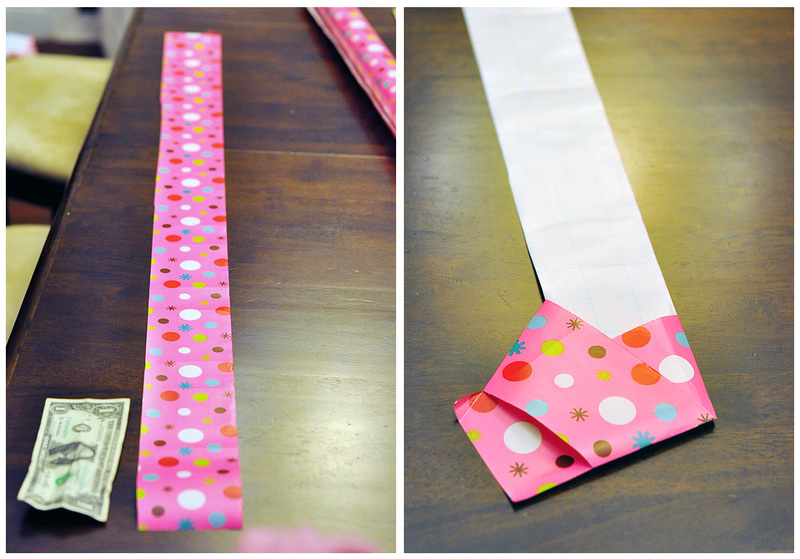 I used wrapping paper that was 4 inches wide by 40 inches long. Avery loved these large stars and it wasn't too long before she shook them and realized there was a surprise inside. 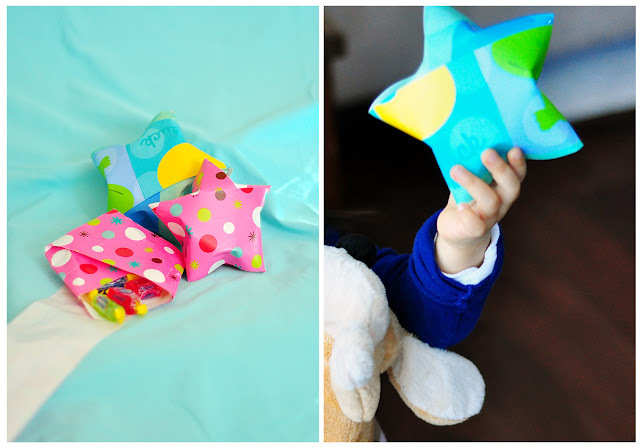 Here is my video on how to fold these stars. 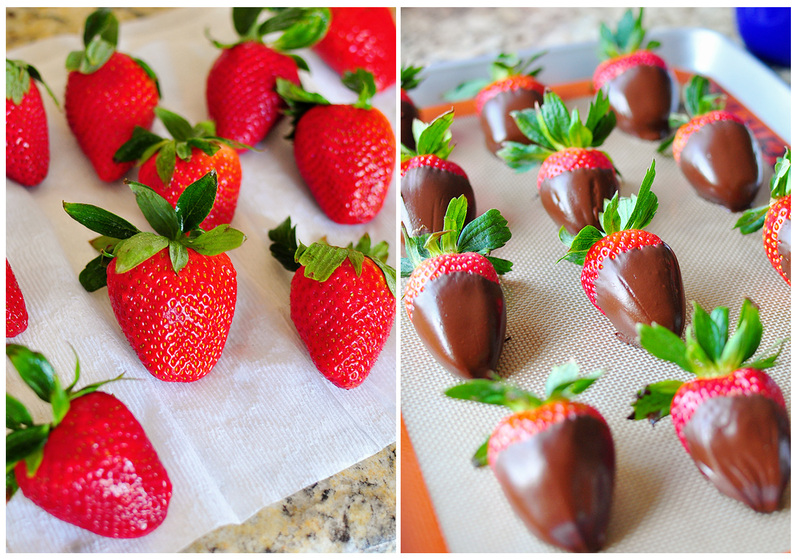 Every Valentine's Day I make chocolate dipped strawberries for my husband. The first time I made it my husband at the entire plate, and every Valentine's Day after that he would ask me "are you going to make chocolate dipped strawberries this year?" 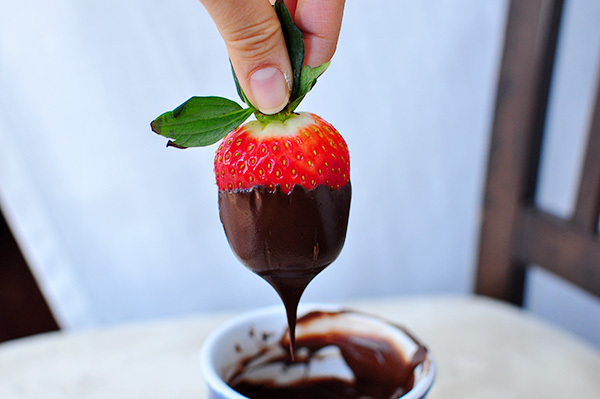 Making chocolate dipped strawberries is one of those things that is simple I don't know why people would actually go out and buy them. Strawberries are always on sale around here during Valentine's Day also. I purchased a pound for 1.50 at Ralphs (Kroger in some parts of the country). To melt chocolate follow the instructions here: http://www.thecheesethief.com/2011/09/chocolate-covered-gummy-bears-recipe.html but do not add butter. 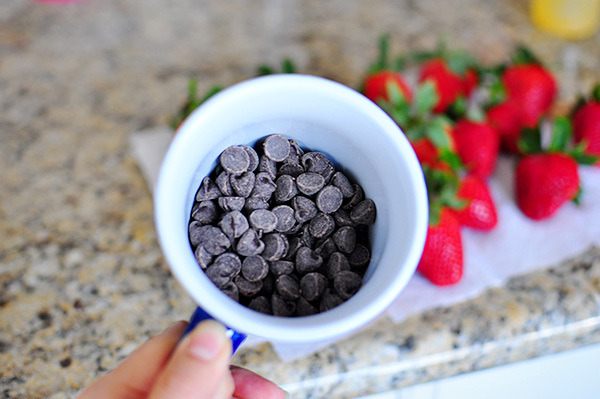 The basic instructions are for 1 lb of strawberries melt 6 oz of chocolate in a microwave safe bowl for 40 seconds. 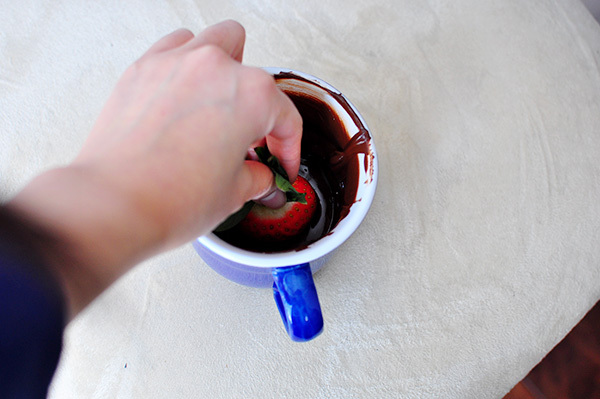 Take out and stir with spatula for 30 seconds, reheat for 15 second intervals if chocolate is not melted enough. 1. Wash the strawberries and thoroughly dry them. You do not want any moisture on the strawberries. 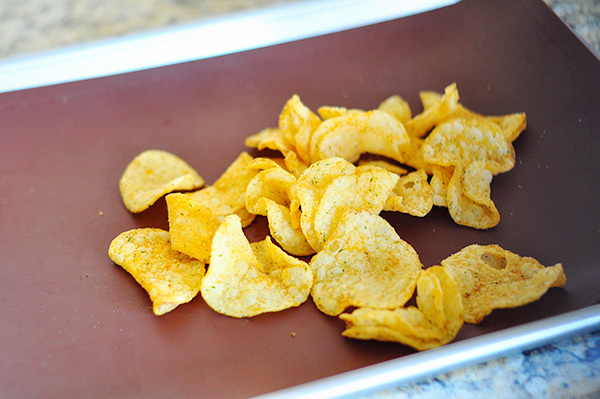 Use a kitchen towel and go through each one to make sure they are completely dry. 2. Let the strawberries sit at room temperature for about an hour or two. This will help so you do not have to keep reheating your chocolate. 3. DO NOT burn the chocolate. Heat only as necessary. I cannot stress enough how important it is to have dry strawberries. Moisture is the enemy of chocolate. 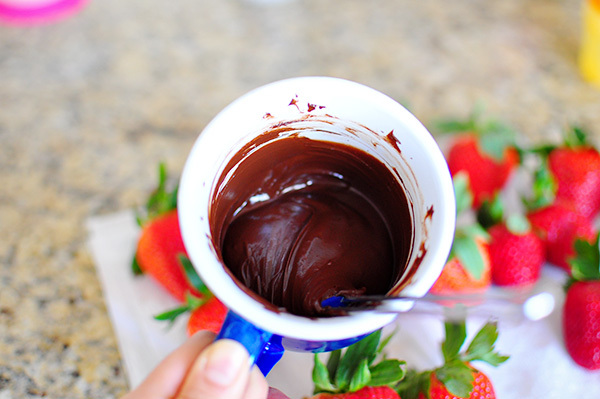 Dip strawberry in wiggle back and forth gently a couple of times to get a good coat. 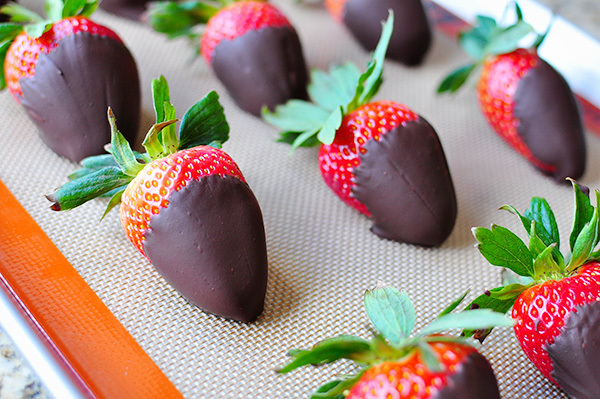 Pull strawberry up and place on parchment paper, foil or silicone baking sheet to cool. Let cool in fridge for 15 min or on counter top for an hour. I love the flavor combination of sweet and salty. What I love even more is sweet, salty, and spicy. This to me is the holy trinity of flavor combinations. 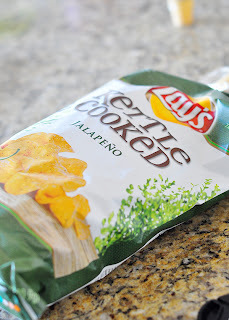 I decided to experiment with this flavor combination by making Chocolate Covered Jalapeno Potato Chips. I used semi sweet chocolates which added a bit of bitter to the flavor combo, but looking back I could have done without the bitter and just used milk chocolate instead. 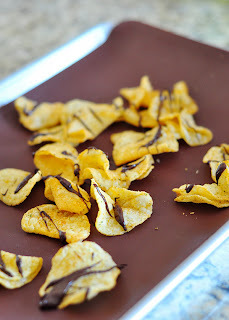 These are so simple to make, you can do it for any party or just as a fun snack. 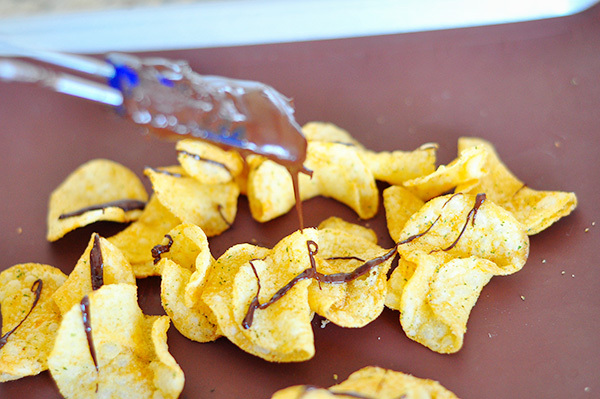 All you have to do is melt chocolate in a mug and drizzle onto the chips. 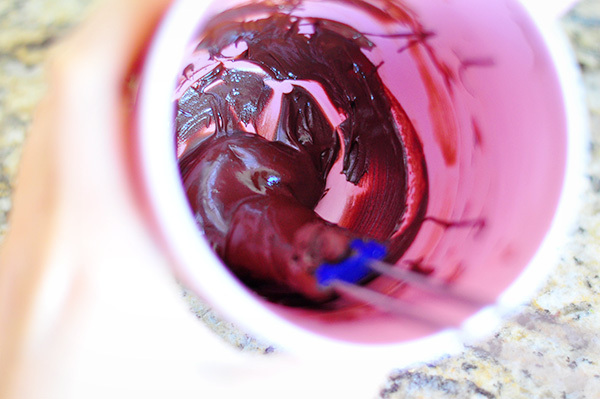 Here are a couple of my posts on how to melt chocolate: white chocolate and dark chocolate. Remember the key is not to overheat the chocolate! One of my favorite blogs right now is Scissors Paper Wok by Kimanh. 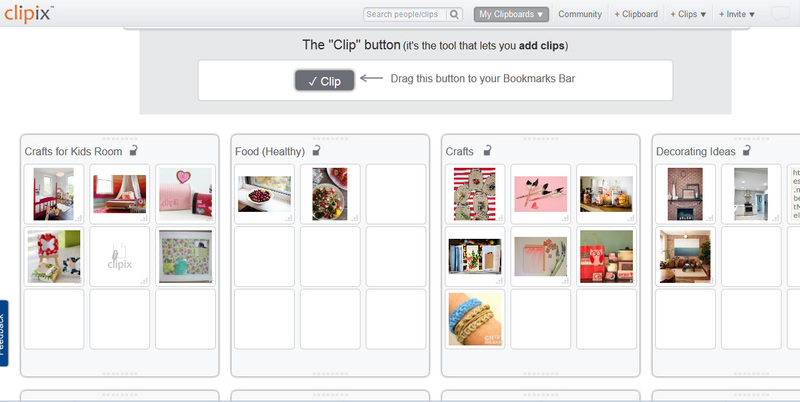 I found her blog when I was looking for how to make custom buttons. While looking through the rest of her blog posts I saw this post on how to make custom pencils. 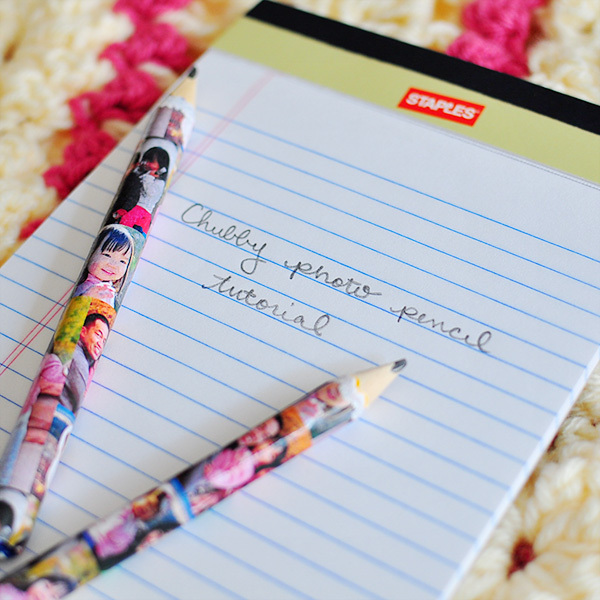 Her pencils are pretty cool looking and I knew I wanted to try to make some. Unfortunately, I didn't have any pencil lead, so I improvised and used regular number two yellow pencils. Avery is getting at the age where she loves to draw and is starting to write. Wrapping the number two pencils with paper not only made them cute but thicker so her little fingers have a better hold of them. I also trimmed the pencils down to make them easier for her to hold. 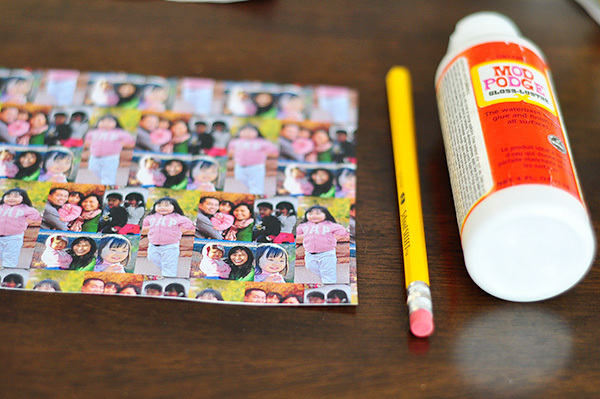 I printed a mosaic of pictures on regular printer paper (on a laser jet printer). Cut the pencil to about 6 inches (I don't have a saw so I used wire clippers and sanded it down). 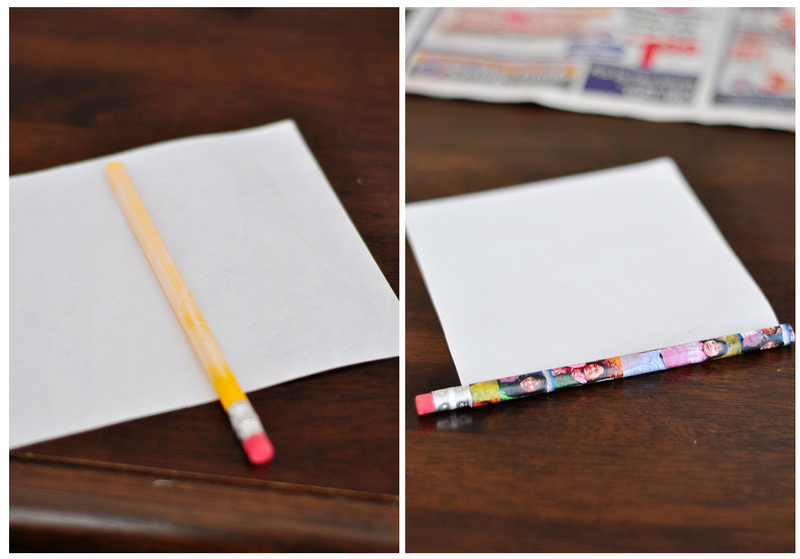 Mod Podge the entire pencil and then roll staring from the end adding Mod Podge as you go. Cover the outside of the pencil with Mod Podge. 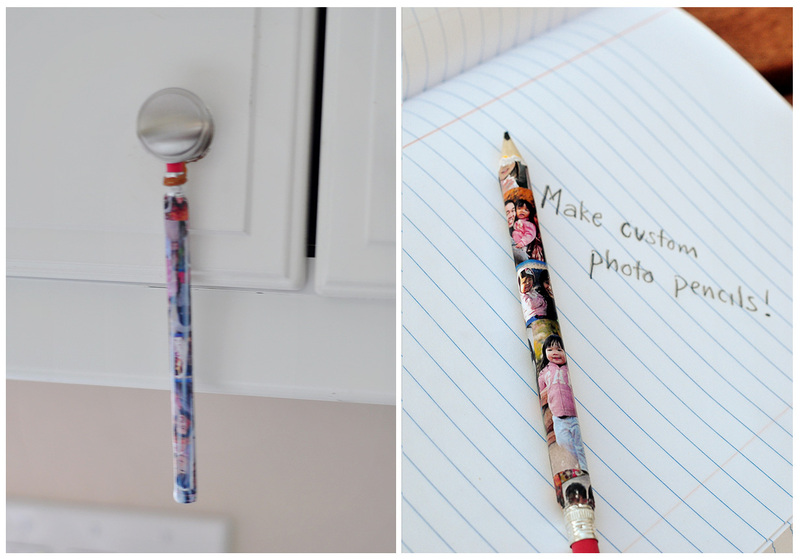 Hang dry for about two hours then your pencils are ready to use. To hang dry i put a rubber band around the end of the pencil. 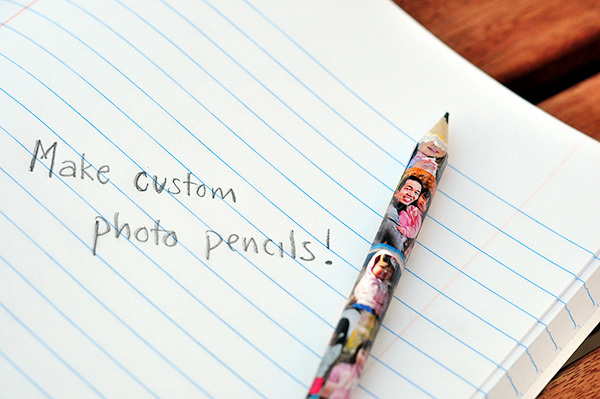 You could also put a rubber band around the tip of the pencil where you are going to sharpen it. It is easier to tie the rubber band on before you apply the final coat of Mod Podge. I used a large pencil sharpener to sharpen it. A few months ago, I was contacted but the ConsumerCrafts.com (an online crafts retailer) to write for their blog, CraftsUnleashed. Needless to say I was ecstatic and jumped at the opportunity. My first post for them was published today. I would love it if you checked me out over there. 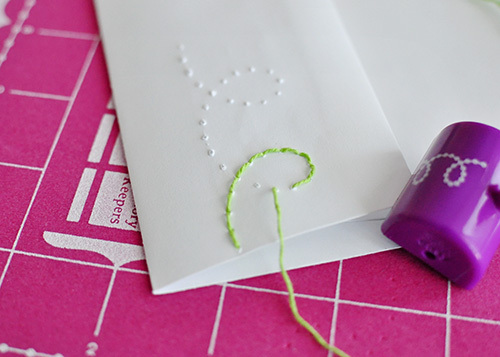 I wrote a tutorial on how to embellish your envelopes by using the awesome Sew Easy Piercer Tool to stitching them. Also if you have the time you can check out ConsumerCrafts.com. They have a lot of great craft supplies for excellent prices. 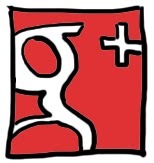 I will be writing two to three posts a month so stay tuned for more tutorials. Avery and I made this picture surprise for my mom for Valentine's Day. 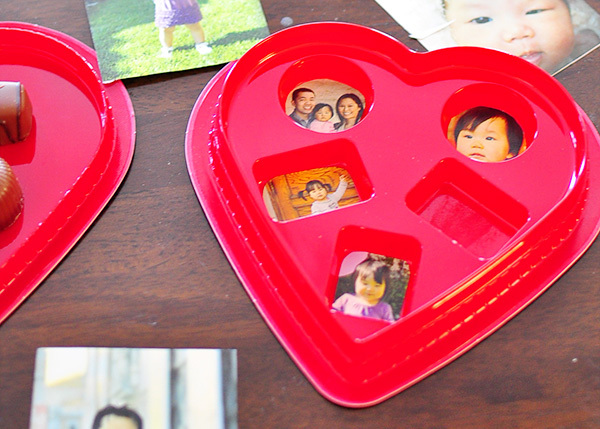 She helped me pick the pictures and arrange the chocolates back into the box. 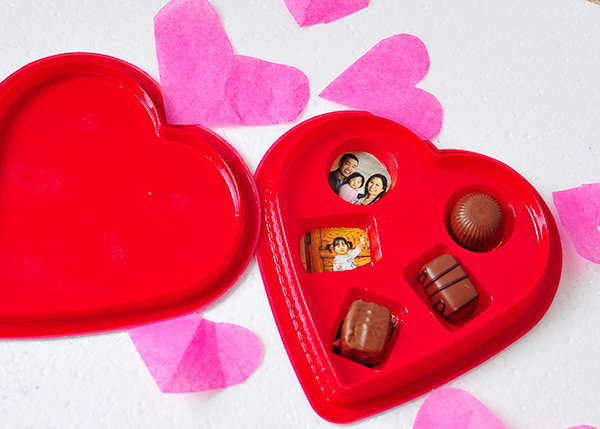 I'm thinking of having her draw on the chocolate box cover too to make it special for Grandma. 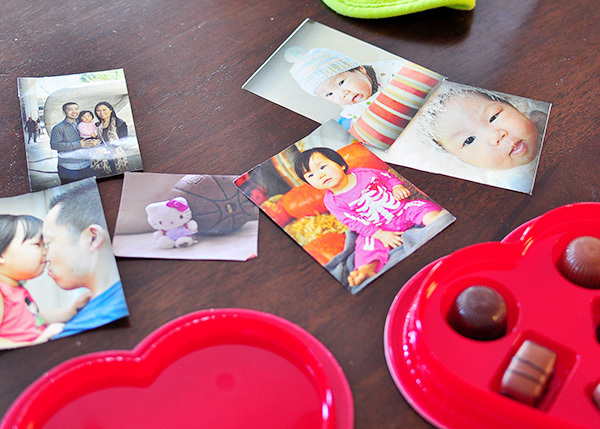 I simply printed some pictures from my laser printer and cut them to the shape of the chocolate. 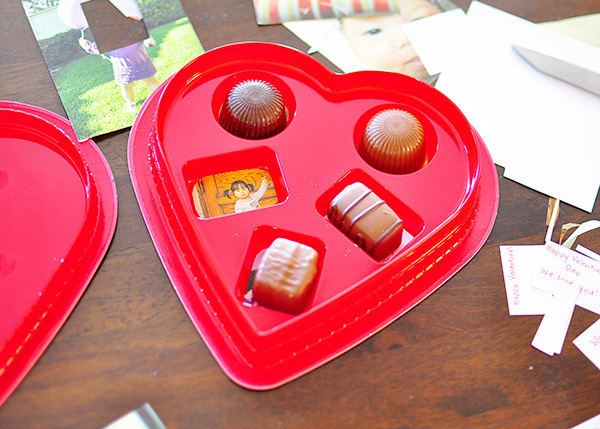 Avery put the chocolate back in their corresponding hole (i did have to stop her from eating the chocolate herself). I saw this on pinterest and thought it was hilarious. But when I clicked on the link, there were no instructions, just a link for a book to buy. Some of the origami looked difficult (so I would probably need the book) but I saw that some of them were just basic origami. 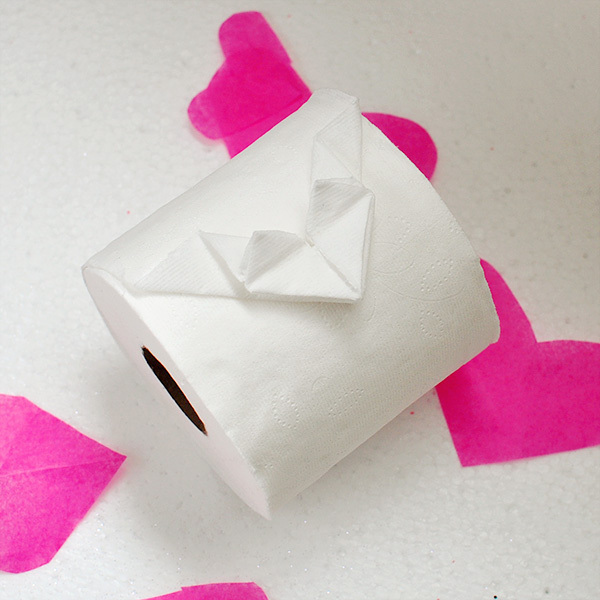 I decided to come up with my own basic origami heart on toilet paper. The steps to this heart are similar to the corner heart book mark. Its actually fairly simple once you get the hang of it. 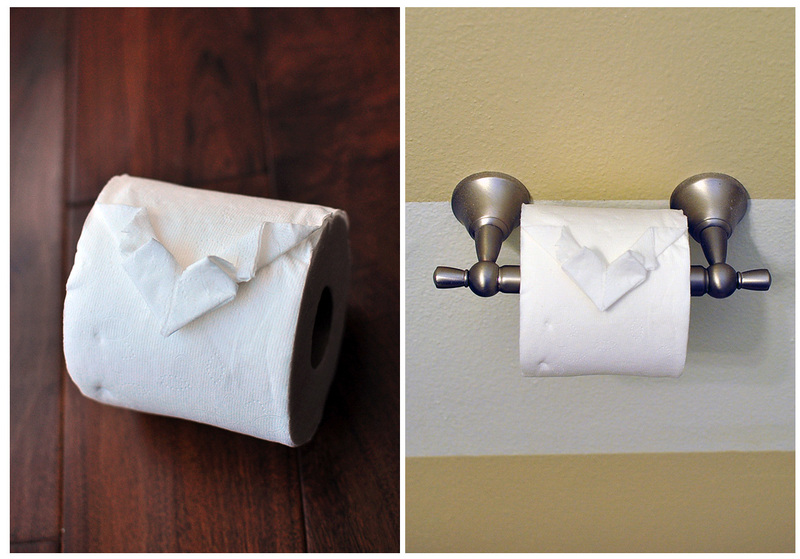 It would be so funny to make these randomly in friend's bathrooms or as a surprise for your kids or husband. I was looking though boxes of old stuff and found this love letter I wrote my husband years ago. It was actually a book that I made him (hand bound and everything) for Valentine's Day that was filled with lyrics to our favorite songs and at the end I wrote him a love letter with a hidden message. The hidden message in the letter was "I want you for always, days, years, eternities." To make this hidden message letter, I first came up with the message and then wrote a letter that contained those words. It wasn't that difficult because those are words I are typically written in love letters. 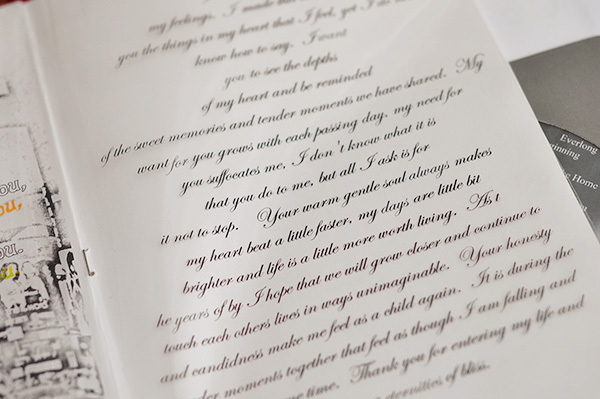 After writing the letter I printed it on a sheet of transparency paper (blanking out the words "I want you for always, days, years, eternities - to do this in MS Word just change the words to white text color). Then I printed another copy of the letter on white paper, with only the message showing (again just changing the text of the letter to white color). It was actually a Valentine's gift that my husband was impressed with. When looking at the letter you can't tell that there is a hidden message. Only when you flip the transparency over will it reveal the message. 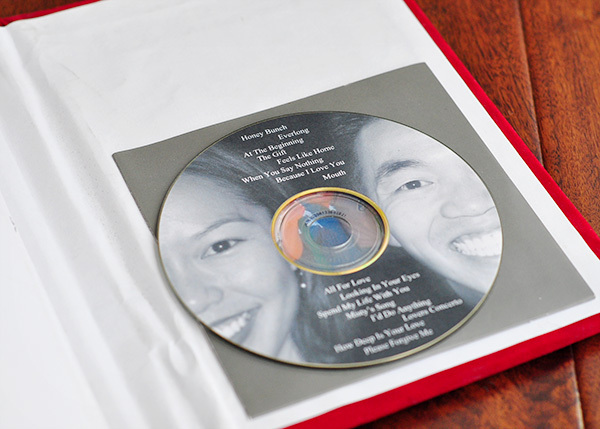 I also made him a CD with our favorite songs and put our faces as the custom cover. This was super easy to do in Photoshop. Do people even listen to CD's anymore? 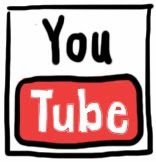 I am so out of the loop. I still have a cassette player in my car.